Two NGOs with close links to a terrorist organisation, are audited by PricewaterhouseCoopers (PwC). Defence for Children International Palestine (DCI-P) and the Union of Agricultural Work Committees (UAWC) have very close links to the Popular Front for the Liberation of Palestine (PFLP), a proscribed and active terror organisation, whose aim is to obliterate Israel. Presumably in a bid to attract similar Israel hating clients, PwC’s Middle East group has also taken measures to obliterate Israel online. Its website map, showing PwC’s offices in the Middle East, does not mention PwC’s Israel Office, or even Israel itself. The map labels the whole of Israel as the “Palestinian Territories”. The UAWC was founded by members of the PFLP and continues to be listed as its official “affiliate”. The Israeli Internal Security Agency (Shin Bet) has recently confirmed the connection of UAWC to the PFLP. DCI-P claims to promote Palestinian children’s rights. However, many current and former officials and employees have links to the PFLP. For example, Hashem Abu Maria worked for DCI-P, “promoting constructive child participation throughout the Occupied Palestinian Territory”. In July 2014 he was killed during a violent confrontation with the IDF and was hailed by the PFLP as one of their leaders in a PFLP mourning notice. The latest DCI-P Annual report which PwC Audited, is dedicated to the memory of Abu Maria. UKLFI has written to PwC International, to point out that by auditing these NGOs’ accounts, and by failing to highlight their terrorist links, PwC has acted in breach of its own codes of conduct and ethical standards, of international auditing standards, as well as in breach of the OECD guidelines for multinational entities. By whitewashing the accounts of these two NGOs, PwC has given them a veneer of respectability, and has falsely endorsed two terrorist linked organisations and thereby encouraged various European countries and other charities to finance these organisations. However, in ignoring these organisations’ terrorist links, it seems PwC failed to comply with ethical standards. UKLFI believes that in relation to both DCI-P and UAWC, PwC has ignored many aspects of its clients’ activities. Far from underpinning investor confidence, PwC has given DCI-P and UAWC’s donors and investors false confidence in leading them to believe that these are bona fide organisations when in fact they both have multiple links to a terrorist organisation. 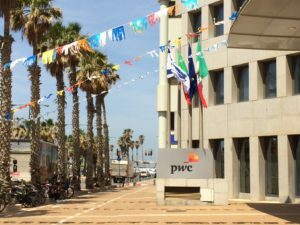 PwC International has a Code of Conduct, set out on its website that applies to all the member firms, including PwC Palestine. PwC says: “Speaking up when something doesn’t seem right demonstrates our integrity and that we have the courage to do the right thing. Speaking up helps to prevent mistakes and misconduct and foster innovation”. No one at PwC spoke up in regards to the terrorist links of the employees, executives and board members of DCI-P and UAWC. PwC states that: “We serve only clients that we’re competent to serve, who value our service, and who meet appropriate standards of legitimacy and integrity”. The board members, executives and employees of PwC’s clients UAWC and DCI-P, who had links to terrorist groups do not appear to meet appropriate standards of legitimacy or integrity. UKLFI believes that PwC is in breach of the OECD ethical guidelines for Multi National Enterprises (MNE).UKLFI has written to PwC to request that they ensure that human rights due diligence training is in place and that all PwC employees are aware of it, in particular those who prepare the audits of the DCI-P and UAWC. We have also requested that they alert all foreign donors of funds to DCI-P and to the UAWC of the breaches of human rights caused by DCI-P and UAWC through their associations with the PFLP.